Page 68 Table 3.1 Regression of postshortage (1981) water use on income and preshortage (1980) water use. 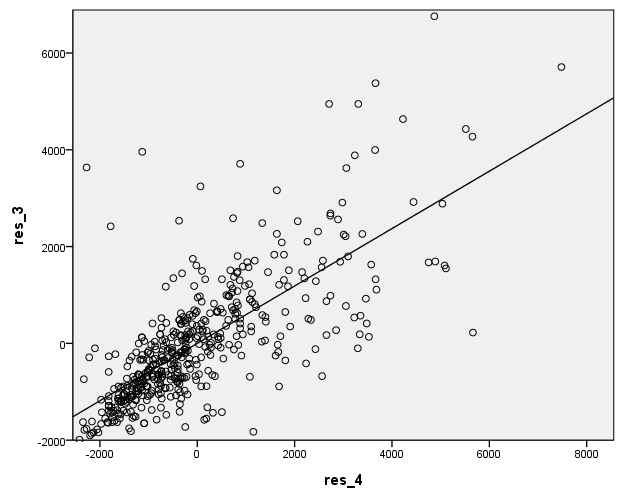 Page 70 Figure 3.1 Partial regression leverage plot: postshortage water use (Y) versus income (1), adjusting for preshortage water use (2). formats res_1 res_2 (f4.0) . 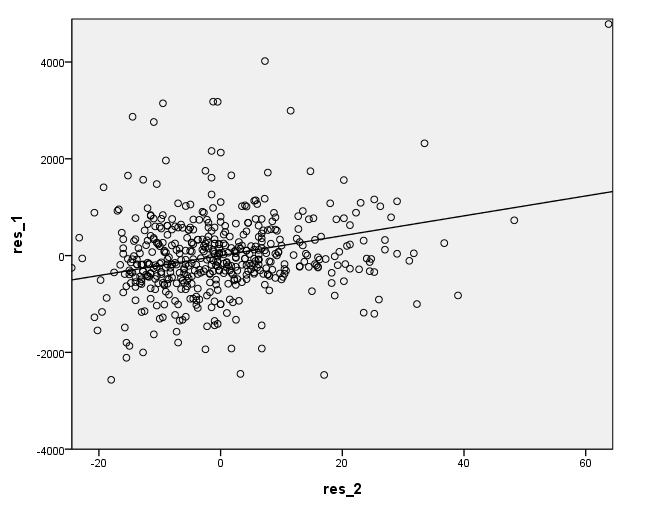 Page 71 Figure 3.2 Partial regression leverage plot: postshortage water use (Y) versus preshortage water use (2), adjusting for income (1). formats res_3 res_4 (f4.0) . Page 74 Table 3.2 Regression of postshortage water use on income, preshortage water use, education, retirement, number of people in resident, and increase in people in resident. /METHOD=ENTER income water80 educat retire peop81 cpeop. Page 80 Table 3.3 Regression of postshortage water use omitting income and education . /METHOD=ENTER water80 retire peop81 cpeop. Page 87 Figure 3.3 Regression of log chloride concentration on a dummy variable for well type. a Predictors: (Constant), bedrock or shallow well? 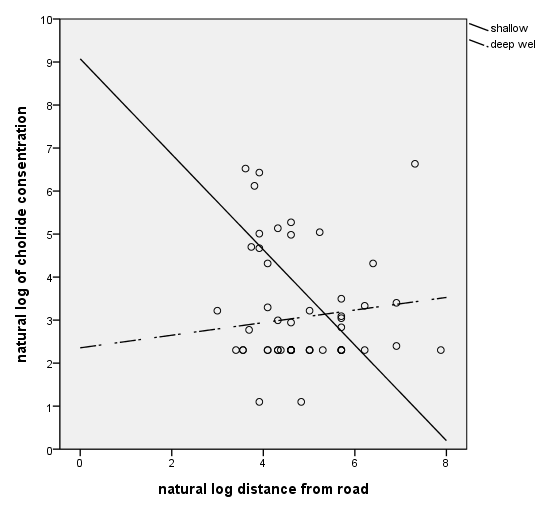 Page 88 Figure 3.4 Regression of log chloride concentration on log distance from road and an intercept dummy variable for well type. deep bedrock or shallow well? formats lnroad lnchlor pred1 (f1.0). 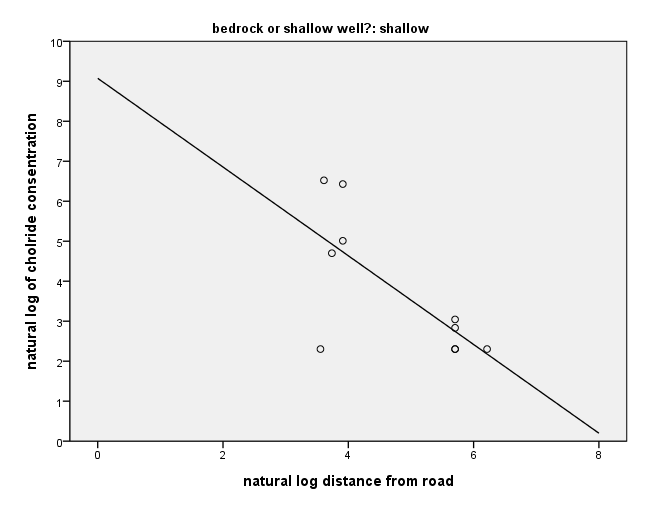 Page 89 Figure 3.5 Regression of log chloride concentration on log distance from road and a slope dummy variable for well type. formats lnroad lnchlor pred2 (f1.0). 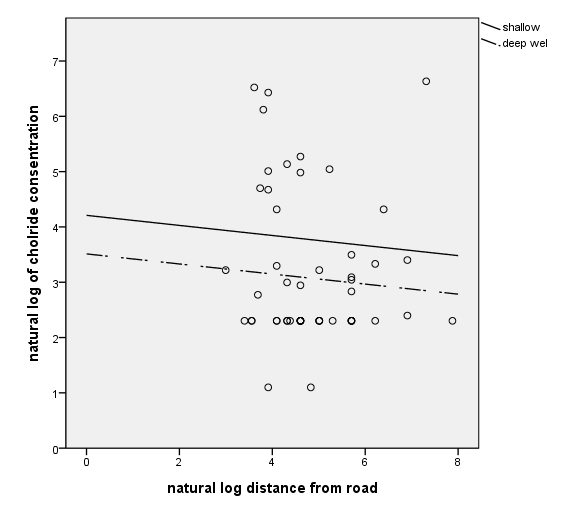 Page 90 Table 3.4 Regression of log chloride concentration on log distance from road, with intercept and slope dummy variables for well type. 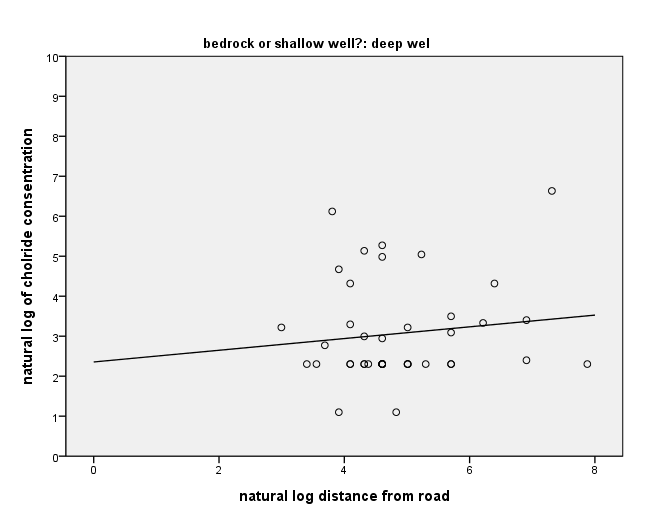 a Predictors: (Constant), DEEPROAD, LNROAD, bedrock or shallow well? 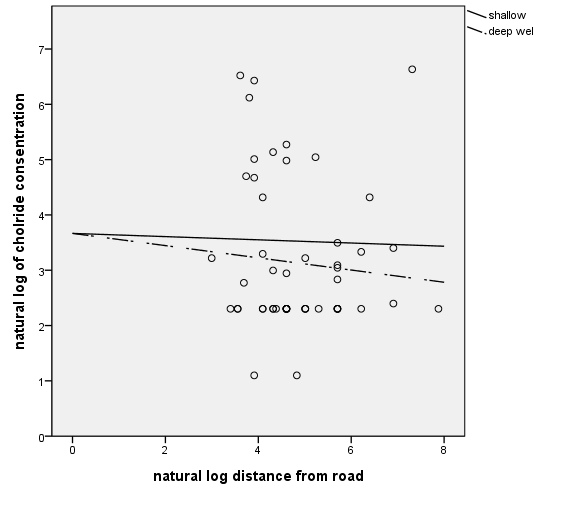 Page 91 Figure 3.6 Regression of log chloride concentration on log distance from road, with slope and intercept dummy variables for well type. 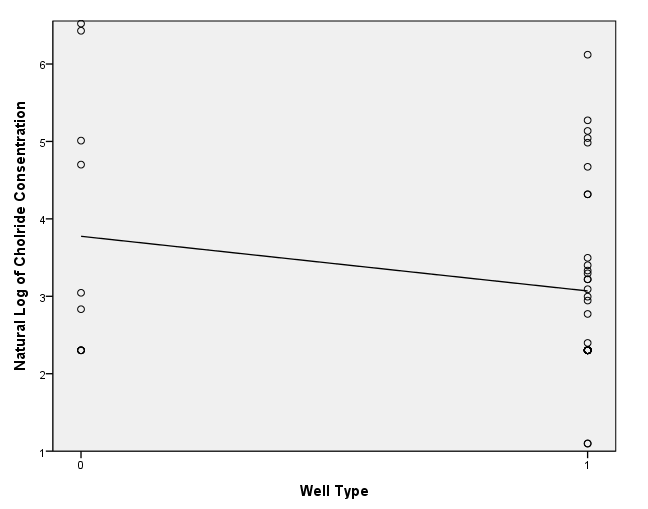 Page 91 Figure 3.7 Separate regression for shallow (left) and deep (right) wells; same line as in Figure 3.6. Page 93 Table 3.5 Cancer, bedrock and radon in 26 counties. recode radon (0 thru 1.5=1) into mnradon. recode radon (1.6 thru 2.45=2) into mnradon. recode radon (2.5 thru 10.0=3) into mnradon. list county cancer locale reading fringe mnradon lowradon midradon. Page 94 Table 3.6 Relation between cancer rate and bedrock area. a Tested against the full model. b Predictors in the Full Model: (Constant), Fringe area dummy, Reading Prong dummy. Page 96 Table 3.7 Relation among cancer rate, bedrock area, and radon. b Predictors in the Full Model: (Constant), MIDRADON, Reading Prong dummy, Fringe area dummy, LOWRADON. Page 98 Table 3.8 Relation among cancer rate, bedrock area, and radon, with interaction. /METHOD=TEST(reading fringe lowradon midradon) (x1x3 x1x4 x2x3 x2x4). b Predictors in the Full Model: (Constant), X2X4, X1X4, X1X3, X2X3, MIDRADON, LOWRADON, Fringe area dummy, Reading Prong dummy. /DESIGN = area mnradon area*mnradon. Page 99 Table 3.9 Effect coding of bedrock area from Table 3.5.
list county area reading ereading fringe efringe. Page 100 Table 3.10 Relation among cancer rate, bedrock area, and radon. /METHOD=TEST (ereading efringe v3 v4) (v1v3 v1v4 v2v3 v2v4). b Predictors in the Full Model: (Constant), V2V4, effects-coded fringe, V3, V1V3, V2V3, effects-coded Reading, V4, V1V4.